Line a baking sheet (preferably a 4 sided baking sheet pan) with parchment paper. Slice tomatoes in half and arrange, cut side up, on lined baking sheet. Lightly drizzle tomatoes with olive oil. Just enough so that each tomato has a bit of oil on it (they shouldn't be swimming in oil). Lightly sprinkle the tomatoes with salt (kosher salt is the best, because you can see how much is on the tomatoes), then sprinkle with freshly ground pepper and thyme. 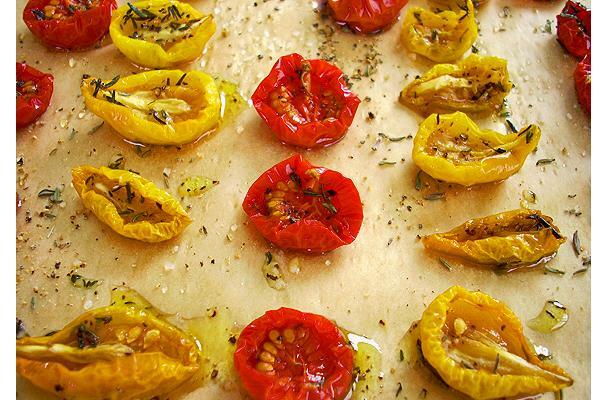 Slide the sheets of tomatoes into the oven and bake for 3 hours. If you are doing more than 1 pan, switch the racks that the tomatoes are on half way through the cooking time. The tomatoes are done when you see that they are dried and shriveled but still show some moisture in the centers. Your actual cooking time may vary depending on the size of tomatoes you use. You can't have fresh garden tomatoes all year round. But why not have the next best thing? Roast those juicy tomatoes and savor them well into the winter months.